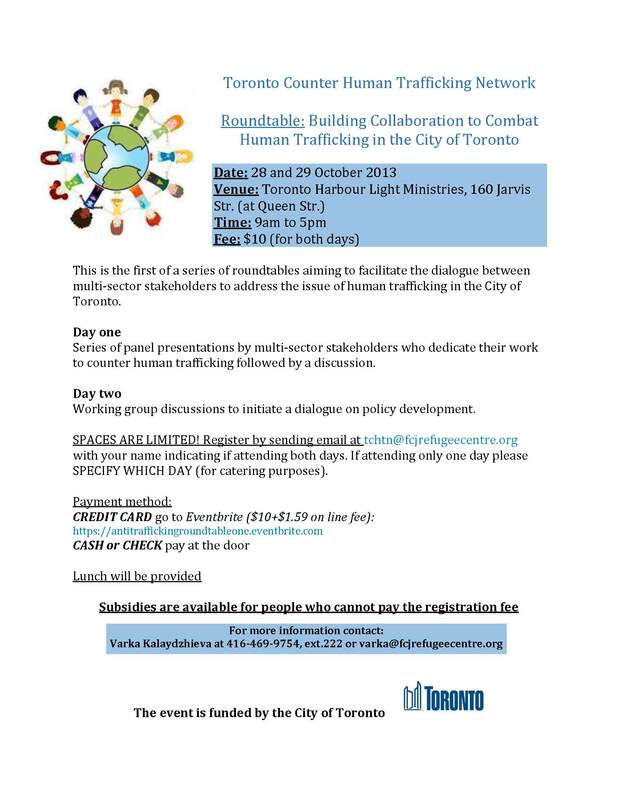 The Roundtables series carried out over several months to facilitate the dialogue between multi-sector stakeholders to address the issue of human trafficking in the City of Toronto. The series will begin with an extended roundtable conference that will bring together multi-sector stakeholders to initiate dialogue and begin to develop protocols and promising practices to offer services and protection tailored to the needs of trafficked persons. The initial roundtable will be followed by two subsequent meetings, to work through longer-term goals, new developments and unforeseen challenges. Initiate policy development on city and provincial level. Series of panel presentations by multi-sector stakeholders who dedicate their work to counter human trafficking followed by a discussion. Working group discussions to initiate a dialogue on policy development and set the stage for the following meetings to work through longer-term goals, new developments and unforeseen challenges. SPACES ARE LIMITED! Register by sending email at tchtn@fcjrefugeecentre.org with your name indicating if attending both days. If attending only one day please SPECIFY WHICH DAY (for catering purposes).